Anti-Twin is an excellent application to e.g. 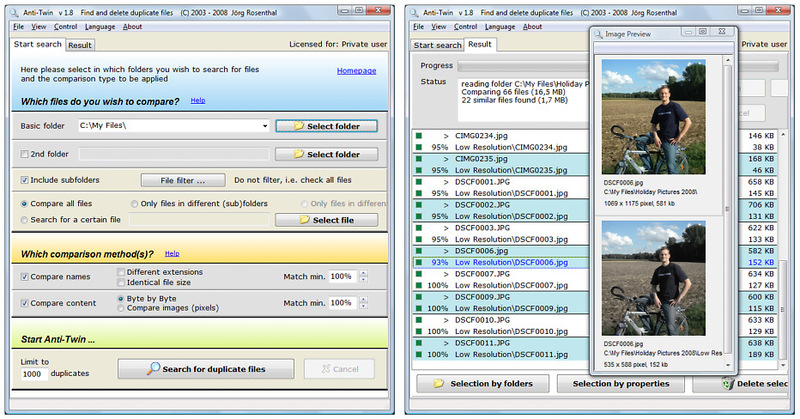 find and delete duplicate MP3 files in a download folder or to find similar images. Apart from that, Anti-Twin helps you clean up employees' chaotic file repositories in company networks, e.g. by searching for unnecessary file copies and redundant data back-ups. Anti-Twin is freeware and can be downloaded from the Download page (see menu top right). Please also read the instructions and note the warnings. Dear Jörg, I just want to thank you for this fantastic, bug free and easy to use software. Over the last week I have spent many hours buying three software packages to sort through 60,000 duplicate photo files (all the other software packages would would run for many hours, one run for 18 hours to simply crash and they all cost me together just under $100). Your software took less than two hours cleaned up half the collection with NO MISTAKES. I am so happy to see simple software that simply does the job. I am happy to donate money to you as you saved me many more frustrating hours and maybe more wasted money. Let me know what money would make you happy within reason lol and I will be happy to send to you or if you want a gift or something from Australia simply let me know. If you like Anti-Twin, please recommend our website. Thank you!